Since September 2012 Russia has been quietly building up its gold reserves, hitting 1,149.8 tonnes last month — it’s highest level since 1993. In the process the country has overtaken both Switzerland and China on its way to amassing the sixth largest gold reserve pile in the world. This was part of a sensible strategy to diversify its foreign exchange reserves (currently $US439 billion in size), which were overwhelmingly held in dollars and euros. 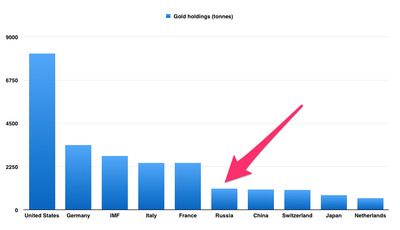 Despite the huge increase, gold still accounted for only 9.7% of the country’s total reserves as at the end of August — though recent spending by the central bank to defend the rouble is likely to have increased its share. World Gold CouncilGold reserves by country. Click to enlarge. On Wednesday, Kseniya Yudaeva, deputy chairwoman of Russia’s central bank, promised to sell the country’s gold to fund imports “if it becomes necessary”. The worry is that the country may struggle fund imports due to sharp falls in the value of the currency, international sanctions over Ukraine, and a flagging economy. Russia’s international reserves have fallen from $US509 billion at the start of the year to $US439 billion at October 24, as the central bank has bought roubles to soften the currency’s decline against the dollar and the euro. This has raised concerns that, if sanctions continue and the country’s reserves fall further, it could threaten the country’s ability to import crucial goods and services. Russia’s former finance minister and current chairman of the Committee of Civil Initiatives Alexei Kudrin raised alarm bells last month when he wrote a blog in the daily newspaper Kommersant warning that available reserves could barely cover six months of imports at current prices. Six months of Russia’s imports are worth approximately half of the current level of international reserves, which are valued at around $US454 billion. If we subtract the reserves used to insure the government’s budget, the remaining value of reserves only slightly exceed the amount needed to pay for six months of imports. With reserves now closer to $US430 billion, it is highly likely that this level has been breached. Yudaeva may therefore be suggesting that the central bank would be willing to sell gold to generate enough dollars to insure the government’s budget to fund imports. Unfortunately for the government the announcement could not have been worse timed. Gold is getting crushed. It hit $US1,140 per ounce on Wednesday, down by about 2.3%. At one point it got as low as $US1,137, its lowest level since April 2010. Selling into a falling market would fail Investing 101. The fact that it was raised, however, demonstrates just how nervous markets are about the country’s fortunes with oil prices remaining below the $US90 level required to balance the country’s budget. Oil and gas revenues still account for almost half of Russia’s federal budget along with 10% of the country’s GDP. Russia’s Ministry of Finance is set to propose spending cuts of about 10% of the country’s budget for 2015-2018. Finance minister Anton Siluanov said that although the government could dip into its reserve fund to meet its spending commitments, “reserves are not infinite, and the poor economic situation may be protracted”.